Behavior is greatly influenced by stimuli from the environment. This influence results in a process of either strengthening or weakening the association between the behavior and stimuli from environment. Tracking back into time, we have seen the biggest blast in Mumbai was in Year 1993 and then there was a siege of Mumbai in 2008 which to date is the greatest tragedy in Indian history. An armed siege of the civilians of India by another country which shares our borders. However from year 1998 to 2011, there has been an average of at least 1 attack only on Mumbai. Attacks are mainly due to conflicts that are either intrinsic or extrinsic to the nation. Clearly we see that there is failure at various levels in the government in terms of having the right intelligence, right people at the right time to handle such situations and contingencies. Watching innocent people die an unnatural death not even at the hands of nature but at the hands of people who are ruthless and are totally uncompassionate towards human life. I am specifically NOT using the word terrorist or terrorism for a reason. You will understand as you read. From 1998 to date the technology has advanced to heights unimaginable. Message spreads fast. Communication is effective and clear. However over the past few years since the attacks are becoming like a yearly season, the messages from the politicians and the Indian media are being understood clearly for some people like me. Every time if you notice the Indian media after any attack especially on Mumbai, the first thing would come up is the Spirit of Mumbaikar’s who put the attack to the past and get on with life. This is been telecasted almost and always when there are civilian deaths due to blasts or attacks. The media along with the forces of the government is conditioning the people in a manner that they would not care about the attacks or the aftermath of it. This largely makes me question the spirit of Mumbaikar’s. Is walking past the dead to work the spirit? Is being uncompassionate about the death of people in your town the spirit? 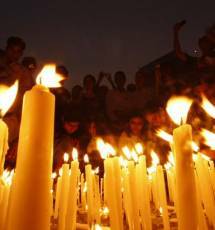 Just lighting a candle for the dead which happens every year due to failure of our security forces the spirit? I really dont share that or even subscribe. By repeatedly getting conditioned by the media on "spirit of Mumbaikars" and the politicians who ask only "for calm the people of Mumbai" has actually lost to understand the value of human life lost as a result of these attacks. As the days are passing the dead are forgotten, the families devastated, yet the spirit of Mumbaikar’s gets them to office next day! It is really a sad situation. In plain terms, its damage of behavior suffered because of the media, politicians & people of India themselves.